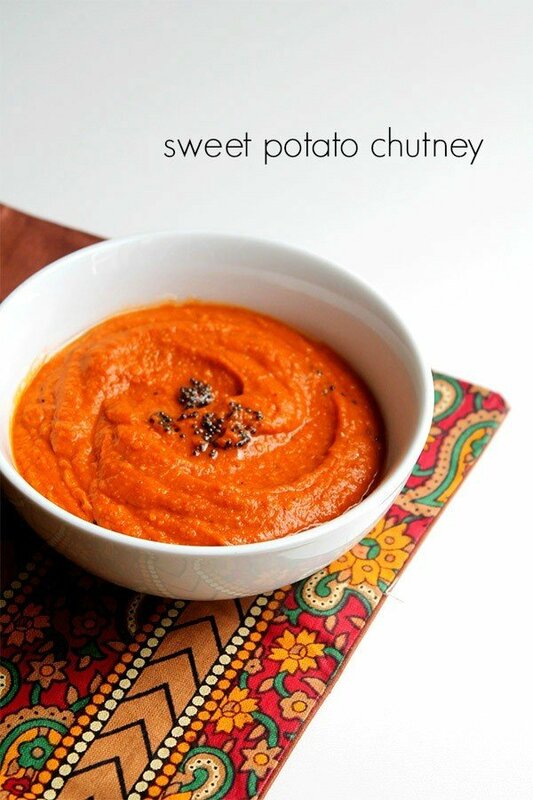 sweet potato chutney recipe - a delicious south indian spiced chutney made with sweet potatoes. 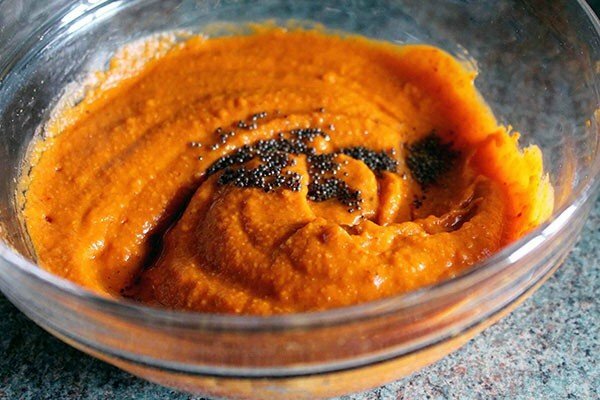 sweet potato chutney recipe with step by step pictures – a delicious south indian spiced chutney made with sweet potatoes. you might agree, that a chutney addition to any meal adds a unique flavor balance. 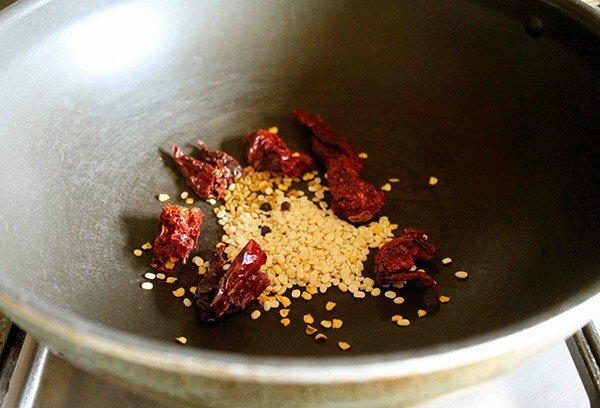 in everyday south indian cooking, chutney is served not only as an accompaniment but also with rice as a main dish. 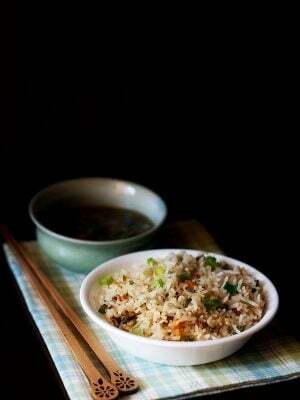 majority of south indian households serve rice as a regular feature in their meals. since, in these regions, the soil conditions are conducive for growing rice. i have been fortunate to have grown up eating varieties of chutneys served as a main dish with rice. this does not however, restrict the use of such chutneys as accompaniments to chapatis or rotis or dosa. having said that, this sweet potato chutney, is a recent inclusion to our menu. 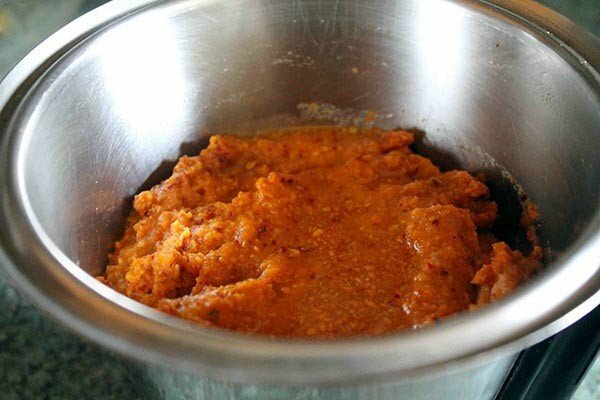 once i had prepared the potato chutney, (the credit for the recipe of which goes to my cousin), i was intrigued and wished to try the recipe with slight modifications using sweet potato. the result was quite enjoyable. the mention of a potato seems to always bring a ‘carbohydrate excess’ consideration to a meal. this does not have to be the case always. if you consume this root veggie in watchful proportions along with a balanced meal, you can reap the many benefits it brings. there are 2 different kinds of sweet potatoes available. i have used the one with the orange flesh and not the purple one. one interesting point to note would be that, it is said, boiling or steaming the vegetable makes it more nutritious. read more here. sweet potato has been know to provide sizable amount of vitamin A for school going children and also adults. 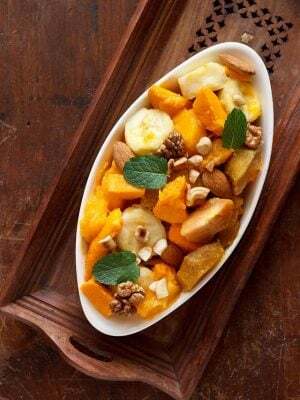 make sure to include small amount of fat in the meal which will help in the absorption of the fat-soluble vitamin A. it is also said to be a stand-out anti oxidant food. such anti-oxidants destroy harmful free radicals in our body providing a safe-guard against cancers. 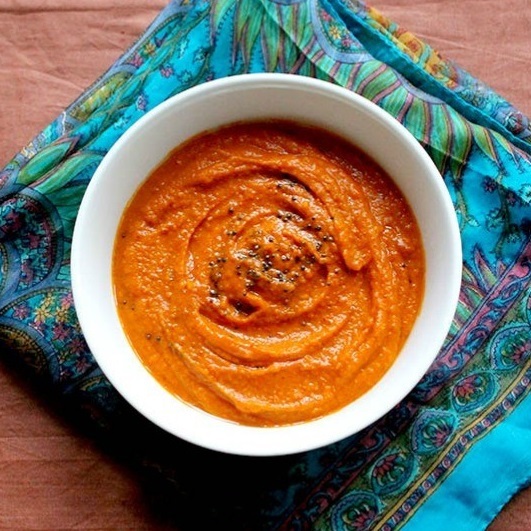 in this chutney recipe, the sweet potato adds a certain natural sweetness which balances other flavors in the dish. 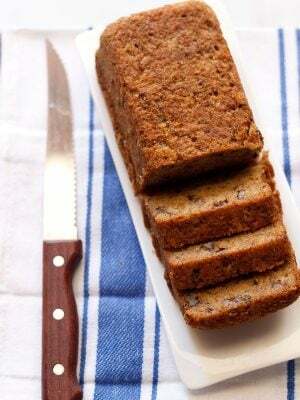 it brings a smooth texture to the chutney and can be served with rice or roti. the quantity of yield is quite good too. i will also post the potato chutney recipe soon. 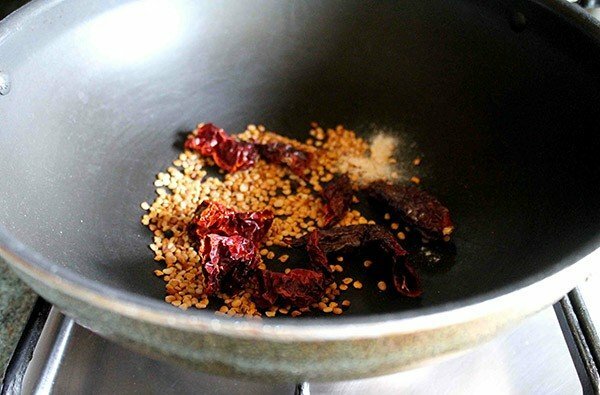 if you are looking for more chutney recipes then do check baingan chutney, coconut chutney, tomato chutney, peanut chutney, onion tomato chutney and pudina chutney recipe. first, wash the sweet potatoes well. 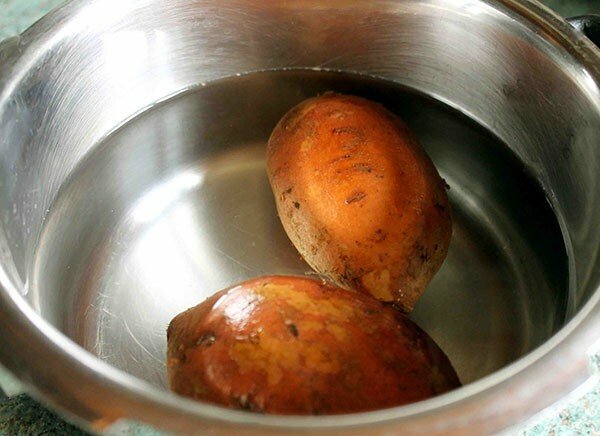 place the potaotes in a pressure cooker. add water just about covering the potatoes. pressure cook for 2 to 3 whistles or till the potatoes have cooked completely. while the potatoes are cooking, in a separate pan, dry roast 4 tablespoons of urad dal, 4 to 6 kashmiri dry red chilies, 2 peppercorns at medium heat, until the urad dal turns golden brown. 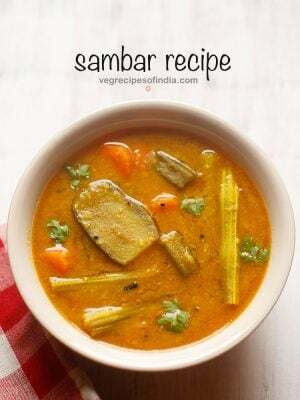 turn off the heat, add the asafoetida and mix. then transfer these ingredients on to a plate and allow them to cool. 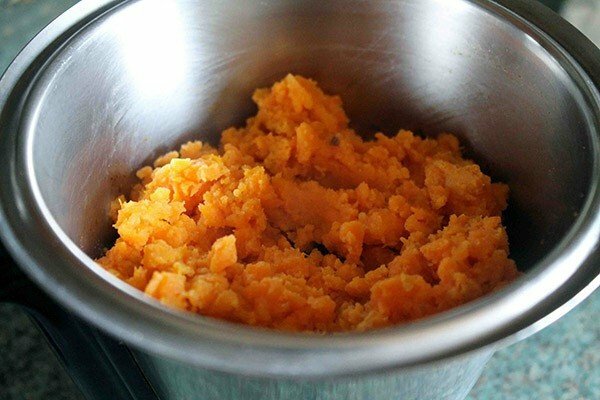 once the cooker with the sweet potatoes has cooled down, open the lid, check using a fork to make sure the potatoes are cooked through. if well cooked, transfer to a plate and peel once cool enough to handle. mash them well. allow to cool. 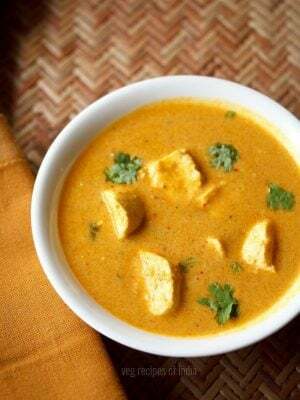 once the spices also have cooled, add them to a mixer grinder, add 4 tablespoons of grated fresh coconut, 1 teaspoon of tamarind concentrate, pulse a couple of times without adding water to break down the spices. 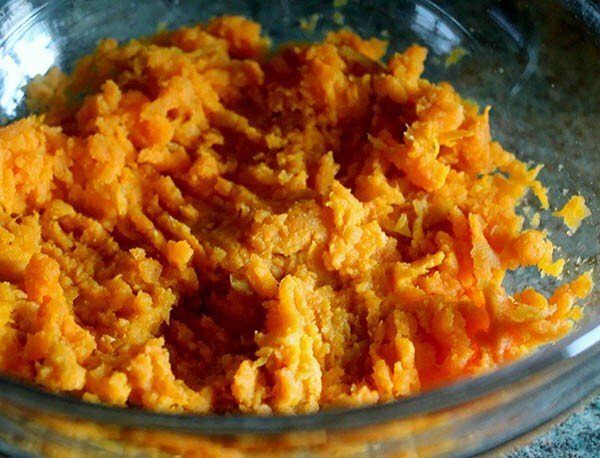 once they break down to a rough mixture, add the cooked mashed sweet potato, salt to taste. grind for a very short while so that everything gets mixed. then add ¼ to ½ cup of water and grind again until it forms a smooth paste. prepare tempering by heating 2 teaspoons of oil in a small pan. add mustard seeds and allow them to splutter. add asafoetida (hing). turn off the heat. transfer the tempering to the chutney. 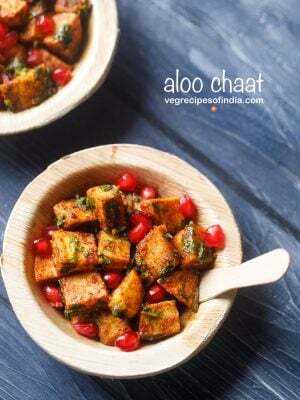 serve sweet potato chutney with roti/chapati/rice or as an accompaniment. 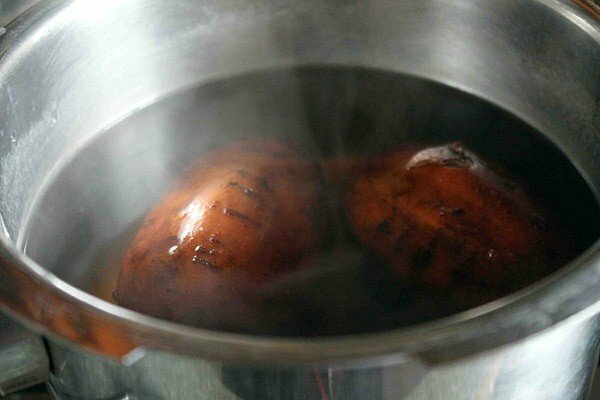 1.first, rinse the 2 sweet potatoes well. in a pressure add the potatoes. pour water just about covering the potatoes. cook for 2 to 3 whistles or until completely cooked and softened. 2.while the potatoes are cooking, in a separate pan, dry roast 4 tablespoons of urad dal, 4 to 6 kashmiri dry red chilies, 2 peppercorns at medium heat until the urad dal turns golden brown. 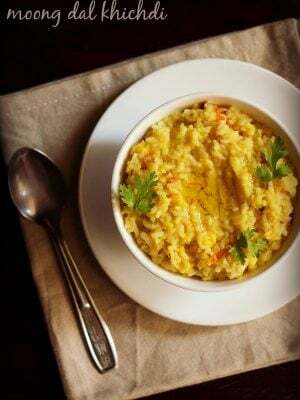 3.once the urad dal has turned golden brown, turn off the heat. add the asafoetida. stir and then transfer the spices to a separate plate and allow them to cool. 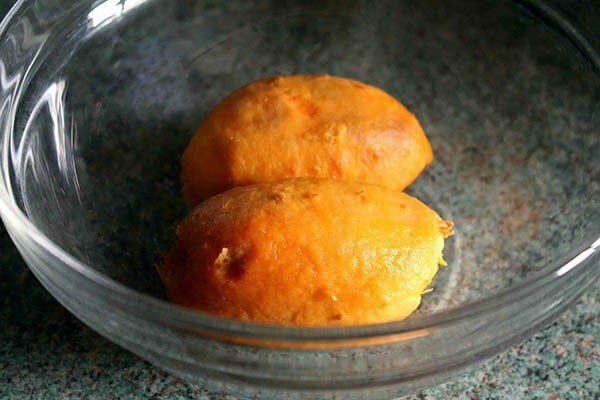 5. peel the cooked sweet potato. 6. mash them well using a fork or a potato masher. 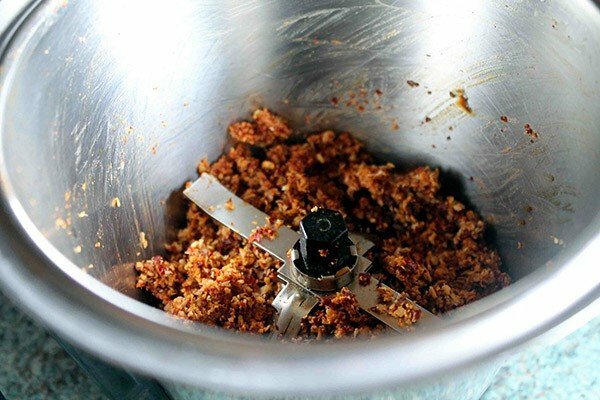 7. now, add the roasted spices to the mixer/grinder. 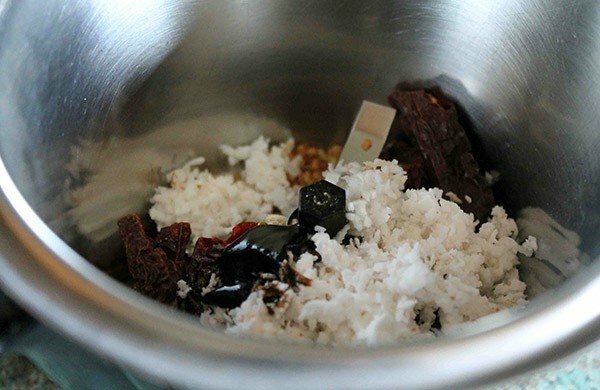 also add in 4 tablespoons of fresh grated coconut and 1 teaspoon of tamarind concentrate. if you do not have a tamarind concentrate, then add a small tiny piece of tamarind. 8. pulse the spices a few times to obtain a rough coarse mixture as below. 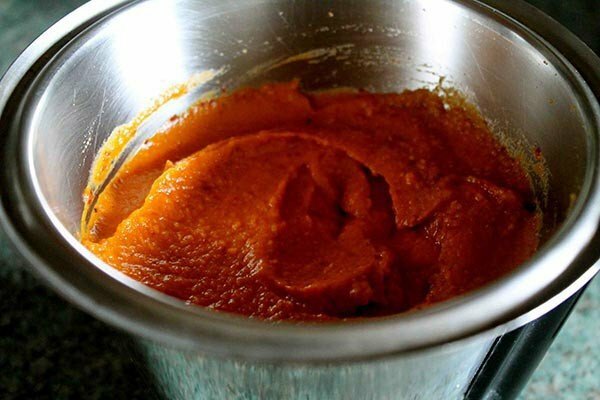 9. add the cooked mashed sweet potato now. now pulse this again so that everything gets mixed well. 11.once you get a smooth mixture (not too thick, nor too thin) such as in the picture below, transfer to another bowl. 13.prepare a tempering in a separate pan by heating 2 teaspoons of oil. add mustard seeds, allow them to splutter, add asafoetida (hing). turn off the heat. transfer this tempering to the chutney. the sweet potato chutney is ready now. 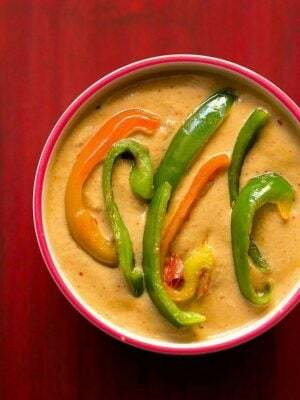 serve with roti or steamed rice or dosa. keep covered in a bowl or a container in the fridge. this chutney will stay good for 4 to 5 days. 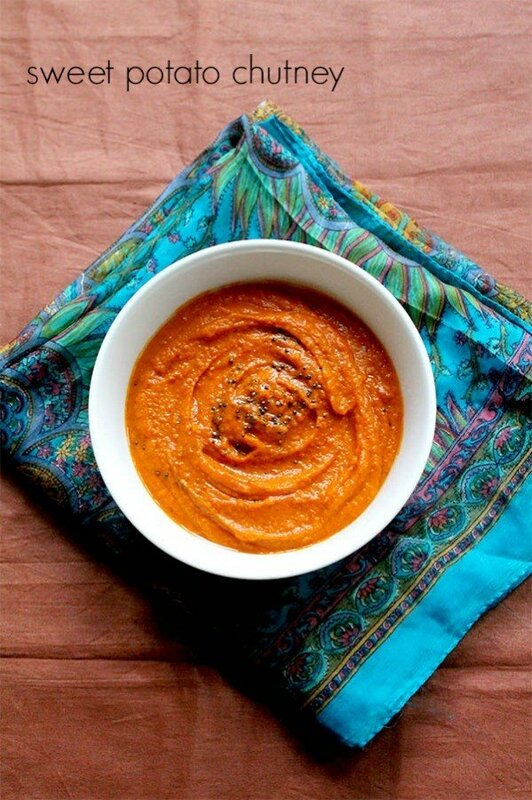 soup or chutney? you can use the purpled ones.